Effektif is hosted web-based process management software with a user interface for designing, executing and managing business processes. Effektif is for coordinating regular or repetitive tasks without having to use e-mail to hand tasks to other people, and without having to use spreadsheets or an array of Post-It notes to keep track of what is going on. For example, keeping track of when employees are going on vacation typically requires handling requests from staff, management approvals, and sending confirmation. Some kinds of work have dedicated software tools that do this. Software developers, for example, use tools like JIRA to coordinate a project team’s tasks. Similarly, doctors use case management systems to keep track of their interactions with patients. For most jobs, though, there are just a lot of spreadsheets and e-mail. Effektif is for everyone else: once you have some idea about what it is and what it’s for, it only gets really interesting when you understand who it is for. 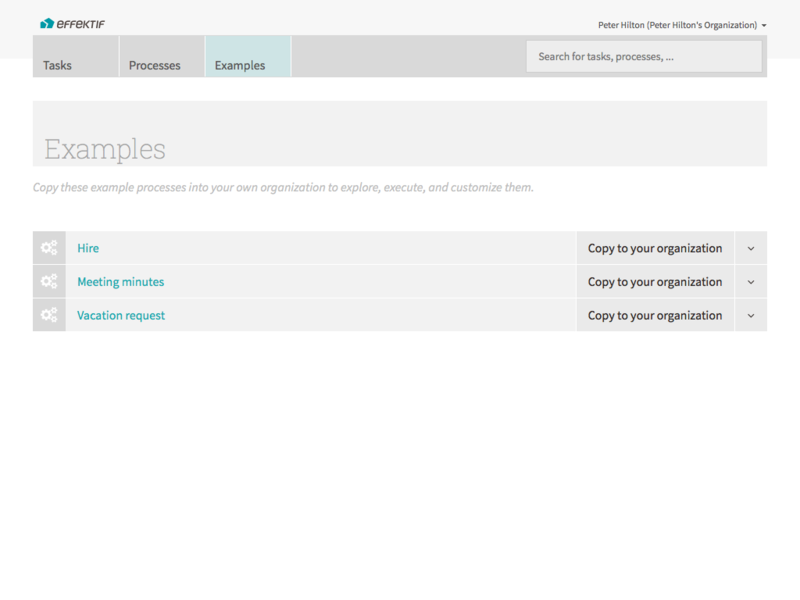 Effektif is for a broad range of business users from administrators to managers. This is where Effektif differs most from traditional BPM solutions that are frameworks for developers. 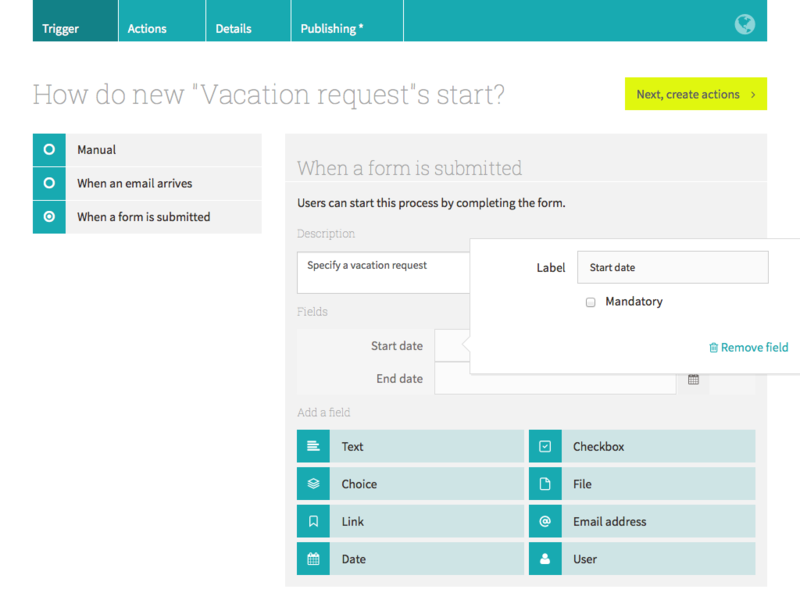 Handling vacation requests is a good example of a simple business process that does not justify custom software development, but can still benefit from software support. In general, every job includes repetitive or regular tasks that involve multiple people: not just vacation requests, but things like document approvals, collecting sales figures, planning business trips or hiring employees. Crucially, every organisation does these things in a different way, and changes these processes over time. 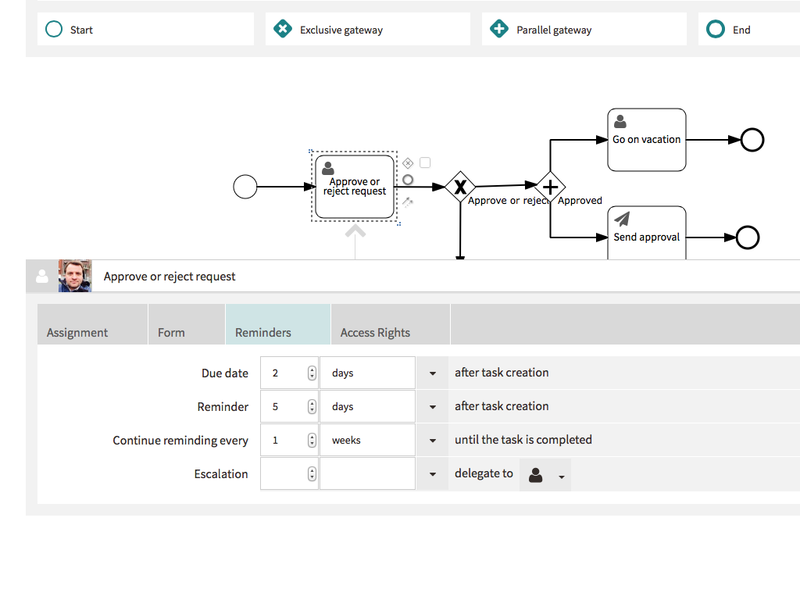 With Effektif, it’s straightforward to set-up a repeatable process that includes a form for capturing a vacation request, and work-flow for a management approval. Giving end-users ability to capture their own processes is a big deal, because making simple things possible without coding enables end-users to experiment and make their own tools, without expensive professional IT support, but with the flexibility to change how they work. Until now, personal business software has usually meant the spreadsheets and personal databases with user-defined forms that have long been staples of office software. These tools allow people to structure their data - most spreadsheets are really simple databases - but have never given the same opportunity to structure business activities. Some kind of Microsoft Access for business processes might be a scary thought, but does hint at massive potential value. After all, thousands of cobbled-together processes being used for real would give the business analysts and software developers a lot to work with. What can you really use this for? What does this mean for software a developers, if anything? What about integration with existing IT systems? How does this compare to other tools? Several reasons, indeed, to give Effektif a second look.